Arizona Cardinals head coach Bruce Arians publicly shared on Tuesday that he coached at least part of the 2016 season with kidney cancer. The revelation comes from Arians’ book The Quarterback Whisperer, which was released on Tuesday. Fortunately, Arians writes in the book that the cancer is no longer an issue and will not prevent him from coaching in 2017. Arians writes in his book that he received a call from his doctor in December alerting him of a small spot detected on his kidney. The 64-year old coach had previously received an ultrasound to check on a hernia. However, the ultrasound also showed a spot on his kidney that turned out to be renal cell carcinoma, a form of kidney cancer. The cancer diagnosis did not prevent Arians from coaching for the remainder of the season. Despite falling short of a playoff spot, the Cardinals won their final two games of the season with Arians still at the helm. In February, Arians underwent surgery to remove a “small portion” of his kidney. That surgery did not prevent Arians from attending the NFL Scouting Combine, which also took place in February. The kidney cancer diagnosis in December was not his only health issue last season. During the preseason, Arians experienced an episode related to diverticulitis, a digestive issue. In November, Arians was admitted to a hospital for tests after experiencing chest pains following a road game against the Vikings. Arians is now he’s cancer-free and has no health issues that should interfere with him coaching the Cardinals in 2017. Arians had two previous cancer scares before receiving the kidney cancer diagnosis in December. He fought and beat prostate cancer in 2007 when he was serving as the offensive coordinator for the Pittsburgh Steelers. In the summer of 2013, his first year as Arizona’s head coach, Arians needed cancerous cells to be scraped from his nose. His third battle with cancer, as well as the recent death of his agent and brother-in-law, seem to have given Arians a new outlook on life heading into the new season. With Arians experiencing a multitude of health issues last season, it may not come as a surprise that the Cardinals struggled to a 7-8-1 record. Arians lead Arizona to at least 10 wins in each of the three previous years. 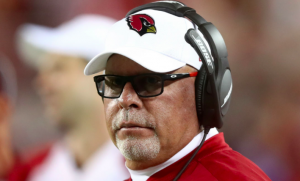 With those health issues hopefully behind him, including his third and most recent bout with cancer, Arians is no doubt hopeful that he and the Cardinals can bounce back in 2017 and return to the playoffs in what could be his final season as an NFL head coach.